Living this one handed life does give me an interesting perspective. Especially when it comes to gloves. And at the same time I do encounter difficult obstacles and circumstances. Especially when it comes to gloves. Sometimes you got to look at it from my side of the “two-handed coin.” Most people I know have two hands and we do live in a two-handed world. It is fair to say most gloves are sold in pairs with a left and right side. Not so good for me. For a long time I did have quite the large collection of left hand gloves. If I deeply want a pair of gloves I have at times just bought the pair to get the right side. But then I feel like I got the short end of the stick. I mean I paid full price for something which I only need half of and can really only use half. On a couple of occasions I took my stock of left hand gloves to the second hand store… (There is a joke there somewhere!) I was moving and downsizing and just did not want to deal with the extra “baggage.” Other times I gave an extra glove to a homeless person. Not a solid giveaway in my opinion but 50% better for them in their current situation. When I was attending the University of Washington in the city of Seattle someone told me about a website where one-handed people exchanged the gloves they do not use. I love this idea. Though I have never offered to this service or benefitted from it I still find the whole idea absolutely beautiful. I hear there are websites for people with one foot to trade shoes. My best solution has been to go to store and ask if they have any mis-matched gloves. My other best option and one that has worked a number of times has been to ask if I can get one right hand glove for 50% off and then mention they can send the other back to the manufacturer. What has worked better has been to ask if I can put two right hand gloves together and pay full price. Then the store can send the two lefts back to the manufacturer saying they received incorrect stock. This whole plan of action works best when the gloves are not to costly. However, trying to buy a very nice high quality pair of gloves can cost a pretty penny and this approach has not worked well for me. What has worked well for me when I was younger was to just put two right hand gloves together at the store, put my left arm in my pocket, and hope I can get through the check-out without getting caught. Not very ethical but very fruitful to say the least. I have scored many a good “pair of rights” this way. And at the same time I have been busted many times trying this approach. This was an idea I had when I was very young. Seemed to make a lot of sense at the time. I will never forget the first time I tried to do it. Despite my first time was foiled by my childhood friend who was with me I learned so much about my one-handed life in this two-handed world. I also learned a lot about how most people think when they are not really thinking. At least not thinking about my one-handedness. I guess I can understand. It is a two-handed world. 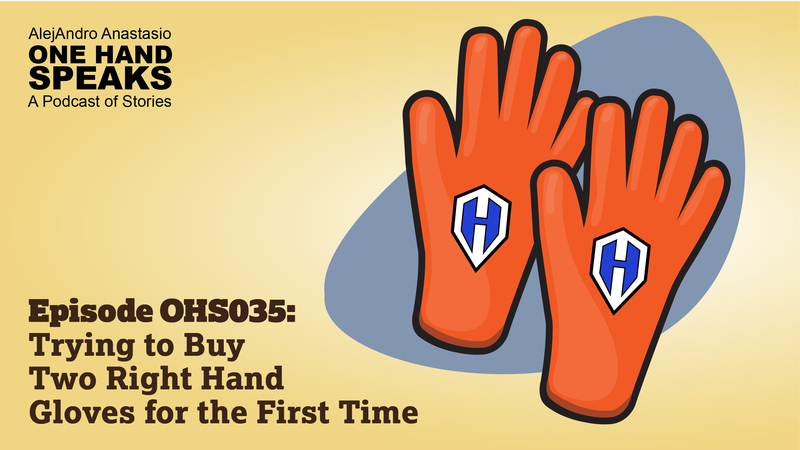 What happened when I first tried to buy two right gloves for the first time has always been a great memory for me. As I stated I did learn a lot about myself. I also learned a lot about my very good childhood friend who was with me at the most precious moment. I also learned how easy and often my friends forget I do not have two hands. The first time I tried to buy two right gloves and was unwittingly foiled by my childhood friend. The trials and tribulations of gloves in a one handed life. Seeing other’s “two-handed thinking” for the first time in a different kind of way. Understanding some not so cool things when people forget I do not have two hands. Single-Handed Solutions – A blog about one-handed solutions and buying gloves! If you enjoyed, benefited or were impacted by the podcast, it would be beyond cool if you’d take a minute and write a review on iTunes. To do that, just launch the iTunes podcast app on your computer or phone. Search for One Hand Speaks, select the album art for the show, select ratings and reviews and then write your review. Big thanks and appreciation. Please spread and share if you feel others will benefit and enjoy and leave a comment or offer feedback.